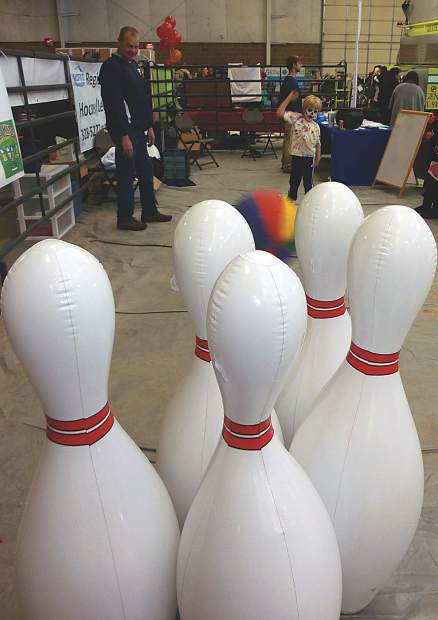 A face-painted participant enjoys some giant inflatable bowling during the Eagle Free Family Fun Fair. This year's event is planned Saturday. Details: Families will enjoy free activities such as the cave of confusion, giant climbing wall, quad bungee jumper, bouncy castle, inflatable slide, tumble bumble, zorb balls, inflatable bowling, balloon animals, face painting, live music, and more. Bring money for food, beverages, and goods from the vendors. What: Second annual Hockey Enables Reaching Out event featuring local first responders. Time: 3 to 8 p.m. Details: Event proceeds benefit SpeakUp ReachOut and the Eagle County Emergency Responders Fund. Tickets are $1- for adults and $5 for kids under 7 years. Visit http://www.speakupreachout.org for tickets. An event after party is planned at 7 Hermits Brewing Company from 7 to 10 p.m. with music from the Platonics and Custom20.